Michael Hong, director of EY China, delivered a luncheon talk on December 13, 2018 on China’s sweeping new individual income tax (IIT) law that comes into effect on January 1, 2019. Hong began by highlighting the differences between the old tax law and the new, noting in particular the introduction of a new definition of “resident” and “non-resident”, creating tax liability and raising double taxation issues for persons who spend an accumulated 183 days or more on the mainland. He also made clear that the 183-day determination is strict, and hence those who spent time in the mainland needed to keep in mind that it was irrelevant whether one’s presence was for business or personal interest – both will lead to China tax residency. Tax liability will also be on worldwide income, and not simply income created on the mainland. This gives Chinese tax authorities broad powers to demand financial information and documentation from individuals. However, it appears that the old “five-year exemption rule” will remain, so foreigners can escape tax liability on their non-China income, provided they have not lived in the mainland for more than five years. More than 70 people attended the luncheon talk, an indication of the importance of the topic to those in the venture capital and private equity industry. The HKVCA would like to extend our sincere thanks to EY, whose sponsorship made the event possible. The HKVCA held its annual Christmas Cocktails at the China Club on the evening of December 11, 2018. This always popular event was opened by HKVCA Executive Director, Wendy Zhu, of AlpInvest Partners. Close to 90 people, representing the many sectors of the private equity and venture capital community, enjoyed spending time with their professional colleagues. With Christmas music playing in the background and holiday decorations visible around the room, this year’s party was a truly festive and celebratory affair. The HKVCA would like to thank both Ascent Partners and Latham & Watkins for their generous sponsorship. Thanks also goes to all the participants who helped to make this event a truly wonderful affair. Jamie Allen, Secretary General, and Nana Li, Senior Research Analyst at the Asian Corporate Governance Association delivered a luncheon talk on the current state of corporate governance in China. Held on December 6, 2018, the talk examined the differing perspectives on the meaning and requirements of corporate governance held by foreign institutional investors versus China listed companies. The speakers also stressed that, as China plays an increasingly larger role in global capital markets, it will be necessary to start to bridge the gap in expectations between domestic and foreign market participants. The importance of the topic was highlighted by the fact that over 50 attendees joined the event. We would like to extend our thanks to KPMG, whose sponsorship of the luncheon made it possible. The HKVCA’s healthcare and biotech seminar was held on November 30, 2018 at the offices of Deloitte. The event kicked-off with an update by Edward Au on the IPO market and a discussion of the opportunities for healthcare and biotech companies. Au was followed by a panel discussion moderated by Judith Li of Lilly Asia Ventures and including panelists Vanessa Huang of BVCF Management and Bosun Hau of Sailing Capital. The panel engaged in a wide-ranging discussion on the investment outlook for healthcare and biotech. Both Huang and Hau spoke of their experiences investing in the sector and drew comparisons between the capital markets in the US and Asia. They also discussed the obvious benefits biotech can bring to Hong Kong and its entire ecosystem. They also gave their views on the most interesting and innovative technologies that have emerged in the past several years and how the overall regulatory environment (for example, CFIUS) will have an impact. The panel discussion ended with the panelists each offering their own advice on investing in healthcare. Close to 120 people attended the seminar and we would like to extend our thanks to Deloitte for sponsoring this very informative event. An LP luncheon talk on the impact of the Committee on Foreign Investment in the United States (CFIUS) was held November 27, 2018 at the China Club. Attendance was at full capacity with more than 30 LP and PE practitioners attending. The speakers, Lorna Chen, Head of Greater China and a partner at Shearman & Sterling, and Massimo Zannella, Managing Director of SS&C Private Equity Asia, delivered a concise presentation on how CFIUS is affecting overseas investments in the US. The event ended with a free-flowing question and answer session. Special thanks to SS&C Private Equity Asia, whose sponsorship made the luncheon possible. 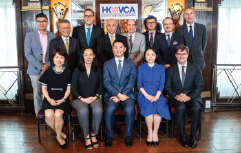 An HKVCA members breakfast meeting was held at the Hong Kong Club on November 23, 2018. This was the Association’s last breakfast meeting of the year, and as has been the case in previous months, it was significantly oversubscribed. With more than 90 members registering to attend, our breakfast events are proving to be among our most popular activities for members. Hosted by our Vice Chairman, Rebecca Xu, members took full advantage of this valuable opportunity for networking and connecting with industry peers and fellow practitioners. We would like to thank each of our members for their enthusiastic participation as well as our sponsor, KPMG, for making this event such a success. The HKVCA hosted its latest luncheon talk on November 22, 2018 at the China Club. Noting the trend toward the use of insurance in M&A transactions, Terence Montgomery, Head of Mergers and Acquisitions, Asia Pacific from Willis Towers Watson, spoke about how warranty and indemnity and tax insurance can maximize strategic outcomes in M&A. The discussion was focused largely on providing dealmakers with a greater understanding of how utilizing insurance products can improve outcomes in the M&A process. With over 40 practitioners in attendance, the event received much positive feedback. We would like to thank sponsor Willis Towers Watson for making the event possible. HKVCA Luncheon Talk - On-Prem, Private Cloud, Hybrid Cloud, Public cloud: Which is the right set up for your firm? The HKVCA hosted a luncheon seminar on November 12, 2018 at the China Club. As many as 30 participants were in attendance to hear Dean Hill, Executive Director, and Michael Steinkuhl, Associate Director at Castle Integration, provide an overview of the On-Prem Infrastructure. Discussion was also had on the different cloud models that are available, and the speakers shared examples highlighting the security issues that users face. We would like to thank all the participants, and especially our sponsor, Eze Castel Integration, for their generous support. The HKVCA hosted a luncheon seminar titled “Polishing the Crystal Ball: Demystifying the Complex Business Ecosystem in India”, which was held on October 11th, 2018 at the China Club. Abhijit Yadav, a principal from Berkeley Research Group, delivered a briefing on the latest economic outlook for India and on the country’s latest policy and regulatory changes. He also forecasted that healthcare, energy and retail would be strongest sectors in the coming 5 years and beyond. He noted that India continued to face a number of challenges and offered tips on how to prevent being tripped up by some of those issues when engaged in transactions on the ground. The HKVCA’s 31st Annual General Meeting (AGM) was held on September 28, 2018. More than 50 members attended this year’s gathering, which saw the election of a new Chairman and the election of 24 Board Members. Outgoing Chairman Eric Mason (2015-2018) delivered his report summarizing the Association’s great work over the course of the last year. He then formally recognized and welcomed the HKVCA’s new Chairman, Chin Chou. We would like to extend our appreciation to members of the Board of Directors and to all members who gave of their time to attend this important Association event. The HKVCA's monthly breakfast meeting was held at the Hong Kong Club on Friday, August 24, 2018. More than 80 members attended the event, most of whom took advantage of the excellent opportunity to network and reconnect with their colleagues and fellow industry practitioners. We would like to especially thank EY for their participation and generous sponsorship. The HKVCA hosted a special luncheon seminar on August 7, 2018 at the China Club. Naureen Rasul, Senior Vice President and Regional Financial Institutions Industry Leader for Asia at Marsh, discussed the important distinction between cyber policy versus computer crime policy, and the differing protections each offers. Using a wealth of statistics, she stressed the necessity of having a robust system of cyber security in place, pointing out the most common cyber incidents and crimes companies are most vulnerable to as well examples of breaches that have actually occurred. The presentation ended with the audience joining in for a pop quiz. With over 40 HKVCA members attending the event, we would like to thank all the participants, and especially our sponsor, Marsh, whose generous support made this event possible. The fifth annual HKVCA Hong Kong Venture Capital Forum, which was held under the name “Venture” this year and co-organized with HKEX and RISE, was held on July 9, 2018 and by all measures was an unprecedented success. This year, the main topic of the forum was venture capital in Asia. Charles Li, Chief Executive of HKEX, kicked of the discussions with a keynote address on HKEX’s role in the new economy. The keynote was followed by two fireside chats, the first featuring Kenny Man, Head of International Investment, Ant Financial; and the second with Alan Feld, Founder and Managing General Partner, Vintage Investment Partners. There were also several panels differentiated by investor niche and geographies, and also a number of roundtables running simultaneously. The by invitation only event brought together close to 450 investors and entrepreneurs from around the world at the newly renovated HKEX Connect Hall. We received a tremendous amount of positive feedback following the event. Its tremendous success would not have been possible without the generous participation and involvement of the audience, expert speakers and the sponsors, KPMG and King & Wood Mallesons. The HKVCA's monthly breakfast meeting was held at the Hong Kong Club on Friday, 6 July, 2018. The event attracted over 70 members taking full advantage of the opportunity to network and reconnect with their fellow industry practitioners. This month's breakfast would not have been possible without the support of EY to whom we would like to extend our sincere thanks for their sponsorship and help in making this terrific networking event possible. The HKVCA hosted a luncheon seminar on technological improvements in private equity on June 28th, 2018 at the China Club. Ajay Narang, Head of Asia Sales on Preqin’s data team, began by reporting on the latest buyout and venture market trends, as well as on investment sentiment in Asia, in particular China. Henry Wadsworth, Head of Business Development in Asia Pacific at Preqin Solutions, then shared his observations and views with respect to LP expectations and requests, while Andrew Kehl, Global Head of Sales at Preqin Solutions, then introduced the firm’s portfolio manager solution which, he explained, helps private equity managers function more effectively. With close to 40 HKVCA members attending the event, we would like to thank all the participants, and especially our sponsor, Preqin Solutions, for their generous support. The HKVCA hosted its latest brownbag luncheon talk on June 21st, 2018 at EY’s Hong Kong offices. EY’s Keith Pogson, Global Assurance Leader Banking & Capital Markets, Eugene Goyne, Executive Director of APAC Regulatory Services, and Sarah Chan, Senior Manager of China Tax and Business Advisory Services, all shared their practical insights on how to effectively and efficiently navigate the regulatory, accounting and tax landscape during an IPO exit. They also discussed the myriad of tax issues financial sponsors might encounter during the IPO process. Over 50 HKVCA members attended the event and we would like to thank the participants, and especially sponsors EY, whose support made the luncheon possible. The 17th China Private Equity Summit, organized by the Hong Kong Venture Capital and Private Equity Association (HKVCA), took place on 5 June, 2018. Attracting close to 600 venture capital and private equity practitioners, leading corporations, and other industry professionals and participants from across the region, the Summit discussions focused on the latest developments and trends in the private equity market in China. Held at the Hong Kong Convention and Exhibition Centre, distinguished guests at this one-day event included: James Henry Lau Jr, JP, Secretary for Financial Services and the Treasury of the Hong Kong SAR Government; Forest Lin, Managing Partner, Tencent Investment; Roger Luo, President, DJI; Chris Ip, Senior Partner, McKinsey & Company; Ivo Naumann, Partner, McKinsey & Company and member of its leadership team in its Private Equity Practice in Asia and leader of its Recovery & Transformation Services Practice in Greater China; and Johan Bygge, Chairman, Asia Pacific, EQT Partners Asia Limited. The theme this year highlighted the strength of China’s PE/VC industry, with M&A activity and control deal volumes at record highs. Leading industry experts addressed such topics as the impact of China’s structural reforms, new policies on regulating overseas investment and what opportunities and challenges lie ahead for cross-border deals. There was also discussion about China’s domestic capital market and other sectors, including technology and innovation. The HKVCA’s Education Committee believes in the importance of portfolio management and a 100-day plan is key for achieving operational alpha. Accordingly, the HKVCA held its first 100-day plan module as part of its advanced series of courses for senior and mid-level private equity and venture capital professionals. The half-day educational course was held on May 29th at KPMG’s offices. Joseph Wan, a senior advisor from Cinven, and Ben Jelloun, a director from KPMG’s deal strategy and advisory team, addressed the nine levers that form a 100-day plan, as well as the keys to balancing expectations. Wan emphasized the importance of designing the scope of the plan, and Jelloun identified several issues that need to be addressed during the course of the first 100 days. He also provided a number of tools that may help participants as they put their plans into effect. More than 30 members of the HKVCA participated in the module, making it a valued segment of the Association’s new advanced level educational program. HKVCA Brownbag Luncheon Talk – Gender Equality in PE: Has There Been Progress? Another of our popular brownbag luncheon talks was held on May 17, 2018. The talk was on the issue of gender equality in the private equity industry and was held at the offices of KPMG, who also generously sponsored the event. More than 50 participants were in attendance. We would like to extend our thanks to KPMG, as well as to our expert speakers: Judith Li from Lilly Asia Ventures; Denise Mak from CVC Asia Pacific; Bonnie Lo from NewQuest Capital Partners; and Iris Zhao from GCM Grosvenor. The HKVCA’s Education Committee held its first ever negotiation module as part of its advanced series of courses for senior and midlevel private equity and venture capital professionals. The one-day intensive course was held on May 14th at the Aberdeen Marina Club and Jamie Barr, an instructor from Summit Professional Development, addressed the effective ways to plan and run the many different types of negotiations. He emphasized in particular the “TKI model” in which the parties understand how to define the negotiation styles as well as behavioral skills for negotiating themselves. Barr also discussed the importance of stakes and relationships through leveraging a game theory matrix to achieve the best outcome. Finally, he provided the participants the opportunity to engage in group discussions and role playing using specific case studies. Sixteen HKVCA members participated and it proved to be an excellent start to the Association’s new advanced level educational program. The HKVCA's monthly breakfast meeting was held at the Hong Kong Club on Friday, 11 May, 2018. The event attracted over 60 members taking full advantage of the opportunity to network and reconnect with their fellow industry practitioners. This month's breakfast would not have been possible without the support of I-OnAsia to whom we would like to extend our sincere thanks for their sponsorship and help in making this terrific networking event possible. The HKVCA’s PRC Committee hosted its latest luncheon on May 4, 2018 at the Morrison & Foerster’s Boardroom. Serena Tan, a funds partner in the firm’s Hong Kong office, discussed the recently released Circular 11, which deals with the “Administrative Measures for Outbound Investments by Chinese Enterprises”. The Circular, published by China’s National Development and Reform Commission (NDRC), addresses issues related to Chinese enterprise investors’ direct investments as well as offshore private equity fund commitments. A number of GPs who attended the luncheon noted their concern over several recent cases and Tan reminded the audience that certain specified investments require reporting and filing with the NDRC. She also discussed fundraising and negotiations under the new rule. Close to 40 GPs and LPs attended the event and both the HKVCA and PRC Committee would like to thank the participants, and especially sponsors Morrison & Foerster, whose support made the luncheon possible. The HKVCA hosted a luncheon seminar on identifying off-balance sheet red flags for pre-transaction and post-investment on April 19, 2018 at the China Club. Stuart Witchell, Managing Director, and Ben Yeung, Director at the Berkeley Research Group, provided their views on the importance of effective due diligence. They also shared some of the many red-flag issues encountered during intelligence engagements in Asia Pacific, especially in mainland China. Yeung also provided some valuable hints on using internet searches to help speed-up the investigation procedure. With close to 70 HKVCA members attending the event, we would like to thank all the participants, and especially our sponsor, Berkeley Research Group, for their generous support. The HKVCA hosted its latest Brownbag Luncheon Talk on April 16, 2018 at the offices of Macquarie Hong Kong. Elizabeth O’Leary, Global Head of Agriculture from Macquarie Infrastructure and Real Assets, and Sean O’Reilly, Asset Director at Macquarie Agricultural Funds Management and head of its Crop Australia, discussed the latest trends in Australian agricultural investment. O’Leary noted that agricultural investments are tied to weather with a positive correlation between population growth and food production. O’Reilly spoke about the latest technology being utilized in the sector, including GPS guidance, traffic control systems and other innovations that are working to resolve issues and optimize operations and production. The HKVCA and the Real Assets Committee would like to thank the many members who were able to take the time from their busy schedules to attend the lunch and take advantage of the opportunity to network with their colleagues. We would also like to extend a special thank you to our speakers and our sponsor, Macquarie Infrastructure and Real Assets, who made this event possible. The HKVCA's monthly breakfast meeting was held at the Hong Kong Club on Friday, 9 March, 2018. The event was oversubscribed, with over 80 members taking full advantage of the opportunity to network and reconnect with their fellow industry practitioners. This month's breakfast would not have been possible without the sponsorship of KPMG to whom we would like to extend our sincere thanks for their continued support and help in making this terrific networking event possible for our members. The HKVCA held its annual Golf Day on March 2, 2018 at the Hong Kong Golf Club in Fanling. The event was a tremendous success with perfect weather bringing blue skies and a brilliant sunny day. Close to 90 people attended the event, including a number of attendees who were non-golfers. There was a total of 19 teams competing in the tournament, with each team comprised of various GPs, LPs, and professional services providers serving the private equity and venture capital industry. More than 70 golfers teed off and all seemed to enjoy the challenging 40-year-old course and the truly great weather on the day. The tournament was followed by a buffet lunch. In addition to the golf tournament, the HKVCA also held two special events: a hole-in-one challenge and a lucky draw. The lucky draw top prize was a Tudor Heritage watch, which was won by Andrew Koo from EY. A total of HK$33,800 was raised through raffle ticket sales and was donated to the Hong Kong Society for the Protection of Children and the Hong Kong Golf Association's junior development program. We would like to thank our generous sponsors, specifically our Platinum Sponsors Citigroup, Morgan Stanley and White & Case; our Gold Sponsors Ernst & Young, Lexington Partners and Vistra; our Breakfast Sponsor, AON; our Watch Sponsor, Oriental Watch Holdings Limited; our Hole-In-One Prize Sponsor, Mercedes-Benz; our Wine Sponsor, AOC Would Wine; and Lucky Draw Prize Contributors, The Golf Association, Paul Andersson of the Golden Bay Distillery and The Boars Club. We would also like to thank the HKVCA’s Golf Committee - Varun Bery, Chin Chou, Bob Partridge, Sunil Chandiramani and Adam Goern - for their support and leadership. The HKVCA hosted a seminar on Wednesday, February 7, 2018 on the subject of listing private equity funds on the Stock Exchange of Hong Kong Exchange (HKEx). Held at the offices of Neuberger Berman, the seminar attracted more than 25 members of the HKVCA. The speakers at the seminar were John Buser, Executive Vice Chairman at NB Alternatives; Gordon Crosbie-Walsh, Joint Head of China Investment Banking and Asia Head of Equity Capital Markets at Jefferies; and Stephen Peepels, Head of U.S. Securities, Asia Pacific at Hogan Lovell. Among the issues discussed were the advantages of listed private equity and the regulatory framework of listing rules in Hong Kong and the UK. The speakers also shared a number of relevant case studies and the latest industry statistics. The HKVCA's monthly breakfast meeting was held at the Hong Kong Club on Friday, 2 February, 2018. The event attracted over 80 members taking full advantage of the opportunity to network and reconnect with their fellow industry practitioners. This month's breakfast would not have been possible without the support of Berkeley Research Group to whom we would like to extend our sincere thanks for their sponsorship and help in making this terrific networking event possible. The HKVCA’s annual Asia Private Equity Forum (APEF) was held on 17 January, 2018 at the Hong Kong Convention and Exhibition Centre. The focus of this year’s event was on the many challenges - but also the many opportunities - that exist for value creation within the industry. It featured more than 80 expert speakers and panelists representing general partners, limited partners and advisors. There were more than 700 delegates, most of whom were senior level and c-suite executives investing across all stages and geographies in Asia. As it has in previous years, the 2018 Forum brought together diverse and experienced groups of private equity and venture capital practitioners, including private equity real estate and private debt. Among the topics discussed as part of the event’s programme were the key issues emerging in fundraising, investor relations, performance reporting and investor demands for greater attention to environmental, social and governance standards. There was robust discussion on key issues facing investors in private markets, including the making, managing and exiting of investments across key markets. We would like to extend our sincere appreciation to our valuable media partners and supporting organizations, and, finally, to our generous sponsors, whose contributions and support made this year’s Forum so successful. The HKVCA held its annual Gala Dinner on the evening of Tuesday, 16 January at the elegant Hong Kong Country Club. This always popular event, which was again oversubscribed this year, was attended by close to 200 guests who gathered to enjoy an evening of great food, robust conversation and excellent entertainment. With the Chinese New Year just around the corner, each of the tables were decorated with displays celebrating the upcoming year of the dog. But it was perhaps the evening’s entertainment that stole the show, featuring a fantastic performance by two young Hong Kong students playing the erhu, a traditional Chinese stringed instrument. The HKVCA was also pleased to make a special donation during the dinner to the Baptist Oi Kwan Social Service, which provides a diverse range of social services for the elderly, those struggling with mental illness, children and families in a holistic, caring manner. The evening also featured a presentation providing an outline of the many successful activities of the HKVCA during 2017. We would like to extend our special thanks to our cocktail sponsors, King & Wood Mallesons, and to MVision for supporting this very special event. Thank you also to all of our guests who helped to make our annual dinner an unforgettable evening.